What is a bulbous bow and what does it do on a cruise ship? Walking along the pier beside a cruise ship, perhaps you have noticed a long, torpedo-looking structure projecting forward from the bow of the ship just below the surface of the water. This structure is the ship's bulbous bow. Bulbous bows have been around for a long time. Indeed, some say that the ancient Phoenicians had bulbous bows on their ships. The concept became popular for modern passenger ships after naval architect Vladimir Yourkevitch used it in his design for the legendary Normandie in the early 1930s. Now essentially all cruise ships have a bulbous bow. “It is designed to decrease the hydrodynamic drag of the ship. Having a bow like that on a ship increases the efficiency by about seven percent or saves us about seven percent in fuel, which ever way you like. It is a very efficient way to propel the hull through the water,” explains Captain Stig Nilsen, Master of Royal Caribbean International's Brilliance of the Seas. Above: Queen Mary 2's red-colored bulbous bow emerges from the water. Right: The bulbous bow on Brilliance of the Seas is the light blue area just visible below the water. 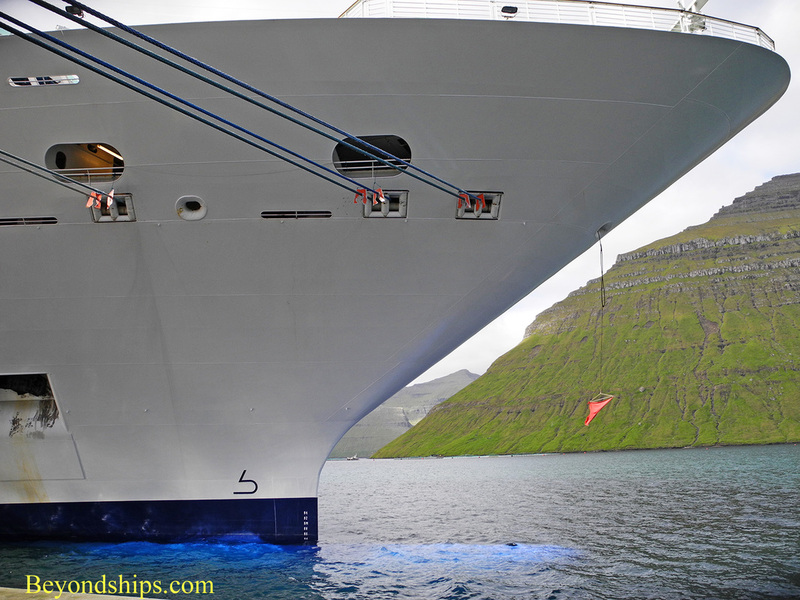 Cruise ship FAQs - - What is a bulbous bow and what does it do on a cruise ship?